Excellent rock climbing locations are scattered along Donegal’s coastline, and particularly great ascents can be found at Ireland’s most northerly point, Malin Head. The sea cliffs, slabs and sea stacks of here provide over 100 rock climbs in a stunning, wave bashed locations. Wild Atlantic Way Climbing will provide adventures for all levels. Perfect surf geology shapes triangulated reefs, river mouth sandbars and assorted beach breaks on the coastline where Donegal morphs into counties Leitrim, Sligo and Mayo. Sligo is one of the hotspots, and the beaches at Strandhill and Enniscrone are perfect for seasoned surfers and learners alike. Loads of surf schools in Sligo are devoted to getting you up on your feet in no time. Sea kayaking is great way to get up close and personal with the unique marine environments of the Wild Atlantic Way. Kingfishers, seal colonies, a vast variety of sea birds, and if you’re lucky, a dolphin swimming alongside all await when you take to the water. Ireland West Seakayaking can take you paddling in Clew Bay, with the majestic Croagh Patrick as your ever-present background. Slap in the middle of the Wild Atlantic Way, the Aran Islands are perfectly suited to the bike. Their compact size makes cycling accessible to people of all fitness levels. It is very easy to explore the historical sites of islands and find complete peace and isolation.Aran Islands Bike Hire on Inis Mor will give you one of the best day’s cycling you’ve ever had. For a rugged hiking adventure, try one of the most beautiful, unspoilt places in the world – Connemara. Its dramatic landscapes, natural terrain and majestic environment offer a wonderland of sights, experiences and adventure activities. You’ll be in good hands with Delphi Mountain Resort, which offers a suite of forest, and mountain-based hikes and activities. The Cliffs of Moher captures the hearts of up to a million visitors every year. It’s a must-see. But there’s an incredible 20km coastal walking trail along a magical vista at this outstanding Atlantic landscape. 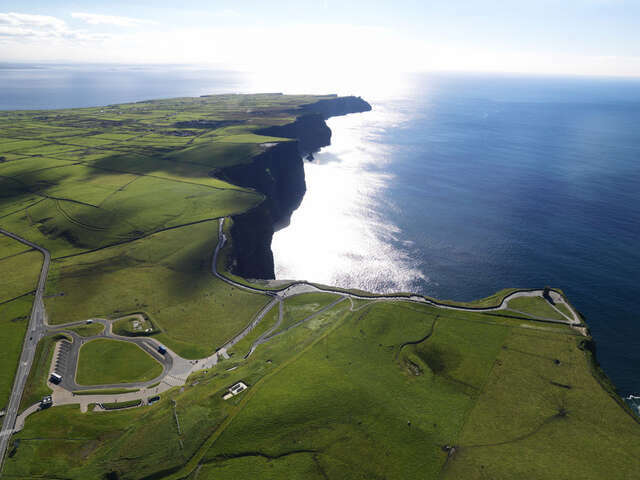 Ask Pat Sweeney to take you on a guided walk along the sea cliffs from Doolin to the Cliffs of Moher Visitor Centre. You’ll never forget it. The lunar landscape of the Burren is a geological phenomenon and remarkably beautiful at ground level. But underground there are 200 caves, including the longest cave in Ireland. This hidden world offers a wide range of challenges, from introductory half-day visits to see underground waterfalls, stalactites and stalagmites, to longer and more difficult caves. The Burren Outdoor Education Centre will take you through it. One of the Wild Atlantic Way’s most amazing sights, the Skellig Islands are a UNESCO World Heritage Site. For several centuries they were home to monks. The other-worldly and well-preserved hermitage and monastic remains are well worth exploring. The islands featured in the recent Star Wars: The Force Awakens sci-fi blockbuster. The splash of the surf, the wind in your hair – for a memorable seaside canter there’s nowhere better than the Dingle Peninsula, which boasts some of Europe’s most stunning beaches. From the sweeping curve of Brandon Bay to secluded sandy coves you can easily find a deserted stretch with nothing but the sound of your horse’s hooves and the ocean for company. The waters off West Cork are excellent feeding grounds for a number of cetacean species. The most frequent summer sightings are minke whales, harbour porpoises, basking sharks, and sunfish, but orcas and pilot whales can also be spotted on rare occasions. Pods of more than 50 common dolphins cruise these waters from August to November. Head out on Whale Watch West Cork’s boat, the Voyager.